Russian mixed martial artist, who has been a UFC Lightweight Champion. @c-mo, If Khabib is only 174cm, how tall is Conor then, barely 5’8” ? You think it’s a possible figure Rob ? 5ft 9 flat and 8.5 could still be realistic for them. Alis bro is roughly 1cm taller than my friend . but the difference between me and my friend is a lot less . I can tell you this from real life for sure that when I stand next to my friend the difference is less than the difference between khabib and alis bro . and the pic with my friend makes the difference between us look a little more than it is in real life . and I am 5'9.25 . so how is khabib my height then ? rob whats your take on this ? is there a chance that khabib could be rather 172-173cm even ? or rather not ? also I would say fedor is 181-182cm no ? and isnt cormier rather 177-178cm ? @c-mo there was a wall in our old house where I used to measure myself in the last few years and I used that wall to measure him with aerosol can method (181.4cm), he was wearing socks.My bro is a fighter he wakes up early at around 6-7 am If I measured him at around 12pm he would be close to 182 cm maybe but as we met Khabib later in the day (8pm) I decided to measure him at about the same time. Well my bro isn't as interested in height as me but he thought they would be closer in height. Fedor is definitely shorter than 5'11 cuz that photo that i posted was taken in like 2014 and my brother was a little shorter than he is now. I still think Khabib is not under 5’9, it may just the angle + your bro’s big hair that favors him to look taller a bit. And I don’t see Fedor under 180cm either, take a look at the shoulder level as well, he has to be around 5’11 flat. 1. how did you measure your brother ? 2. how long was your brother awake / on his feet when you measured him ? 3. did you measure your brother barefeet ? 5. how tall did your brother guess khabib and fedor ? DC 1.77 vs Khabib 1.76? I agree with you guys, Khabib is definitely a little shorter than this listing. Daniel Cormier is taller than him by at least 3cm, 1cm doesnt seem logical considering the height difference in pictures. Imo Khabib is around 174cm - 175cm flat. Conor is around 172cm - 173cm flat these days. Daniel Cormier seems to be closer to 178cm. Sorry for the grammatical errors down there Rob, heheh. 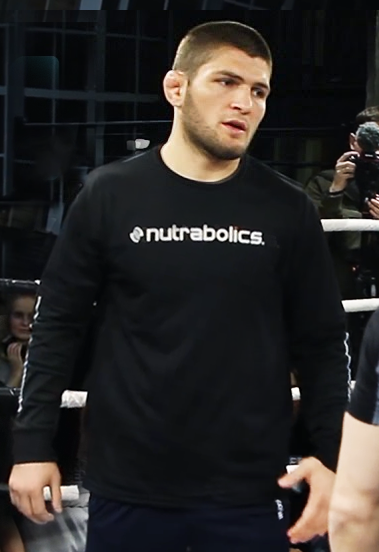 Ali183, i still believe that if Khabib raises his posture to the max without busting a gut, he would look around 6 cm shorter than you're brother. If what you are saying is right about you're brother being a strong 181 in that moment, Khabib does seem about 175.3-175.5 centimetres from that picture, with a tiny margin in footwear possible, i see atleast a flat 175. In my opinion, he has always looked sometimes 175 range or weak 176 range. That makes me think that he is either a few mm above 175 or between 175 and 176. I think he is likely around a flat 5-9, watching from videos and pictures with Cormier and with Mcgregor. I can't see Cormier under atleast 177 personally and from almost every single picture or video, he regularly looks more than a centimetre taller than Khabib (atleast juding from their eye levels and also often heads). Thanks for the answer Rob. I posted the comment twice, because it never showed up here and sorry for the grammatical errors heheh. Well, i hope you consider my opinion, because i usually trust you're judgement, you do it really, really well. But i haven't seen enough pictures to make it logical or convincing enough that it's only a 1 centimeter difference personally in my opinion. Also when you see pictures with other people (Ronaldo the Brazillian for example), he seems to be looking just above his mouth which is around a 6 centimeter difference, you're better than me at judging footwear ofcourse. I understand you also think Khabib is 176 when looking at him with Conor (It regularly looks like a (1.5-2 cm difference between them, also in the fight. Only at times only a 1 cm flat difference). But Conor may be 173.5 cm or around 5-8 and a quarter though. Well, if you want you can take a look again. I measured my bro by myself , i got him at 181.4 at 7pm. My bro wearing yeezys and Habib had sandals with decent platform. Do you guys still think that Habib is 176-177? There is no way. Unfortunately I wasn't able to take a photo with him that day, but my bro did and he himself was expecting Habib to be a little bigger (taller). I'm a big fan of him im not trying to downgrade him, im just saying that he is shorter than this listing. He could be a 5ft 8.5-9 guy that moment. and including other factors like shoes, hair, posture and other factors who influence the height of someone. So i respect you're opinions, but it doesn't seem to be logical for me from all pictures i have seen, that Cormier is only 1 centimeter taller than Khabib. Yes, Khabib may perhaps have a larger head than usual like you stated, but his eyelevel from all pictures we have seen from for example Conorfan below here, his eyelevel always seem to be between 2-3 cm shorter than Cormier's. It looks quite supspicious that in every single picture were Cormier bows down his head, his eyelevel is about the same. In videos aswell, Khabib seems to always look just above the nosetip of Cormier (4 cm), or close to the middle of the noes. You have ofcourse taken into account the footwear advantages, but can you explain have you have conclude only a 1 centimeter difference? It almost never looks like that from every picture between them. I hope you answer, it's just an opinion as i have looked at them 2 very closely. I believe Cormier is around 177/178 cm, while Khabib i think personally is likely around 175 flat, (175.5-176 is not impossible). Conor was always listed as 5-8 or 173 cm in Cage Warriors, you can gain around a centimetr from stretching excercises, so 174 is not impossible ofcourse now. Rob, you are a proffesional who is working with this for many years, studying the proportions of people and including other factors like shoes, hair, posture and other factors who influence the height of someone. So i respect you're opinions, but it doesn't seem to be logical for me from all pictures i have seen, that Cormier is only 1 centimeter taller than Khabib. Yes, Khabib may perhaps have a larger head than usual like you stated, but his eyelevel from all pictures we have seen from for example Conorfan below here, his eyelevel always seem to be between 2-3 cm shorter than Cormier's. It looks quite supspicious that in every single picture were Cormier bows down his head, his eyelevel is about the same. In videos aswell, Khabib seems to always look just above the nosetip of Cormier (4 cm), or close to the middle of the noes. You have ofcourse taken into account the footwear advantages, but can you explain have you have conclude only a 1 centimeter difference? It almost never looks like that from every picture between them. I hope you answer, it's just an opinion as i have looked at them 2 very closely. I believe Cormier is around 177/178 cm, while Khabib i think personally is likely around 175 flat, (175.5-176 is not impossible). Conor was always listed as 5-8 or 173 cm in Cage Warriors, you can gain around a centimetr from stretching excercises, so 174 is not impossible ofcourse now. Looks 7cm / 7.5cm shorter than Ronaldo (listed as 181.5) and 6cm shorter [pic in his Instagram] than DiCaprio (listed as 181), looked imo ~1.5cm taller than McGregor (listed as 174). Maybe he is just around 175. 5'8.75" my opinion for now. @Editor Rob: Found one with Khabib and (Brazilian) Ronaldo, listed 5'11 1/2: Click Here. I think the original 5'9 listing was better. I at least struggle to see him much over that. There wasn't much of a difference between him and McGregor inside the cage, and he looks around 1 inch shorter than Cormier most of the time, and he is not a 5'10 + guy. Funny comments folks might wanna get to the gym..anywho clearly much heavier than conman. Id guess he was 185 similar weight to kevin lee but much less brute power built mostly core "very smart"
Not comparable to fergie or holloway who are much taller longer limbs. Physics 101 kiddies mass moves mass bigger mass "IS" stronger technique is only way to negate. If conmac is 5 8 .5 he is 5 9 or on a perfect day in zero g maybe listed :?. Josh Thomson said he was 183 before starting camp and 172 at the press conference in NYC (on Schaub's podcast). Walk-around weight is irrelevant. As for height, I don't think he's over 5'9. Rob, do you think he looked that (176) near Ronaldo? He's still shorter than a guy like Cormier, but near Ronaldo he could be 175 or 176. Uhh..He was around the same weight as Conor in cage (170-175~). Its a myth that he's a bigger lightweight. Tony and Lee are easily bigger than him. Lee said he is 185 in cage, and I think a 165 division would be good for him. He's 5'9" flat. Just barely edges out Connor Mcgregor. Rob you've upgraded Khabib (from 175cm to now 176cm) so you wouldnt have to downgrade Conor. All the face off's with Khabib and Conor seem to indicate that Conor is in the 172-3cm range (ill admit that i thought Conor was 5'8.5 in the past also) but all the face off's indicate differently. When you first started a page for DC i linked you a couple pics of (now 177cm Listed) DC with Khabib and you agree'd that Khabib seems to be in the 174-5cm range, no more than that or DC would need an upgrade, there's clearly more than a cm difference between Khabib and DC. It's time to downgrade Conor imo. Hi Rob!The all of heights listed here are medium heights?I mean you think khabib is 175.9cm during the day(medium) or its his highest or lowest height? I doubt he walks at easily over 190lb, he's still quite thin and we can agree he's only in the 5'9 range, trust me I'm 6'0 1/2 and quite a wide frame with more fat than Khabib and I weight 195lb theres no way he could cut that much weight from around 195lb, Khabib walks at 175lb max. Nice upgrade rob, the original listing would of made Conor 173cm range, although he still could be! He is about one and a half inch shorter than Daniel Cormier, Google the pic. @animus, nope khabib is the bigger man. its clear to see when you see them next to eachother. conor isnt small, he has really wide shoulders and long arms. but if you look at the width and thickness of khabibs body, neck and head, he is far bigger then mcgregor. he walks at over 190 easily. I think Khabib is over 5'9 for sure, his head is very large (comparable to tysons) so that gives him extra cm's. What do you think? I think overall, he could be the 176cm range. I think you need an upgrade to 5'9 1/2. When they are in the octagon, I think he will have 1 inch on Conor. While Khabib is (slightly) taller than McGregor, you could argue the Irishman is still the bigger man. McGregor’s reach is longer and his shoulders are broader and so is his overall frame. His longer legs will not do him any favours in the inevitable wrestling and grappling exchanges, however, since a lower center of gravity is advantageous. I don’t believe Khabib can get as heavy as 200lbs as some sources claim — his frame is much too small for that. I don’t think Khabib will be much heavier than 175-180lbs on fight night, but then he still outweighs Conor by 10-15lbs. McGregor’s light feet and elusive, snake-like striking game is not predicated on size as much as skill and athleticism, but the size might play a factor on the ground and in securing takedowns. Khabib can look almost 2cm shorter than Cormier, so roughly 5’9 is right — doesn’t drop under it much, if at all, though. We'll see how much apart they really are ( with Conor ) at the weigh ins staredown when they will be barefeet ( or during the octagon staredown ).. if Conor doesn't do his height conscious Bruce Lee like posture that is.. Yes brother Rob, he’s definitely something over 5’9 flat. Giving him 5’9 1/2” won’t be a crime, this listing is like a round down for Khabib imo. Rob, standing in front of McGregor he looks a lot taller. How can 1-2cm height difference be so noticeable? Well you could argue 5ft 9 and change range for Khabib. Yes please can you get the Nate Diaz page up? And may be one for Dana White & Bernard Hopkins? In the Nate Diaz vs Joe Hurley fight, Nate’s listed as 5’11” & on the UFC page, he’s listed as 182cm. 5'9.5 seems pretty accurate. im sure he is more than just 5'9. 5'9 sounds fair, but Rob, please give Nate Diaz a page, i tried to find a video or a tweet where he claims his height but i couldn't, i mean he's listed at 6 foot tall and i'd say that's his minimum height, maybe 6'0.25 max i think. Based in his thumbnail , I thought this guy was 6'3 or something. I would've guessed 5'9 1/4"
Not even 5'9 1/4" Rob ? He had 2cm on Conor easily, I thought he could have 5'9 1/2" honestly. In the past I've thought he could be 5'8 1/2. At times I still believe that is possible, but closer to 5'9 is probably fair, as he did look a little taller than McGregor, and I generally can't see him much under 5'8 1/2. I'll wait with entering my guess until we see them barefoot together, and before saying 5'8 3/4 or 5'8 7/8 is more likely, or if McGregor is indeed a little under 5'8 1/2. I like his name! 5'9" it is! Actually to look at him, I'd have thought he was a couple of inches taller!